Why does biking have a season? Sports have seasons. Is mountian biking only a sport? For me it's not. The vast majority of mountain bikers hang up their bikes in the garage for months as soon as it turns cold enough for there mittens. It doesn't need to be that way. We just had an amazing ride at Copeland Forest on December 17th 2011. What a great day, sunny with a high of -10°. The air was fresh and clear. You wouldn't think so but, there was better traction on the trails then most days in the summer. With no leaves on the trees we really got a sense of the typography of the forest. So this winter free your bike from the garage and join us for the next CTS ride. In the winter there are places you could never go in summer. How about a ride across the lake? Future ride idea? I walk my bike into Total Sports the local bike shop to explain my newest problem to Mark. Nic pokes his head out from the back. "What'd you break this time?" he jokes. I'm surrounded by friends. I feel at home. The Local bike shop is not only a store where you can buy a bike, purchase parts, or get your bike repaired, it's so much more. 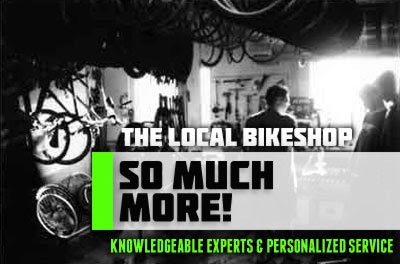 It's a knowledge base location filled with the experts of the bike industry and talented mechanics. Local bike shops understand that buying a bike is a serious decision. 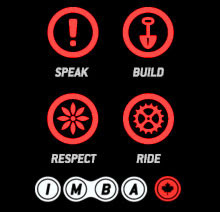 If you bought your bike at a local bike shop, you can ride safe knowing the the person that put your bike together knew what they were doing. As well, you will benefit from great service. Often, the shop will go to bat for you, representing your interests to the manufacturer, and frequently scoring you a fast replacement part. A local bike shop is a hang out, a place where a cyclist feels a sense of belonging. In the winter, when you can't ride, it's a place to go where you can still immerse yourself in your favourite pastime. Local bike shops also often sponsor local bike clubs, groups rides, give lessons, bike fittings, and basic repair classes. My local bike shop knows its customers. The personalized service keeps me coming back. Personalized service is something you will never get when you buy something online. Just because an online item may be cheap, does not always mean it's better. At a local bike shop, you're paying just a little bit more, but you are getting so much more in return. Please support your local bike shop. In these tough economic times, small businesses really struggle against online stores. Let's show local bike shops that we value the services they provide. Do you have a favourite Bike shop? Please feel free to post a link to your local bike shop below.